Between AMLO And Bolsonaro, Can Argentina's Macri Hold Center? While Mexico lurches left and Brazil shifts right, Argentina, under Mauricio Macri, will try to stay a centrist course — at least until next year's presidential elections. 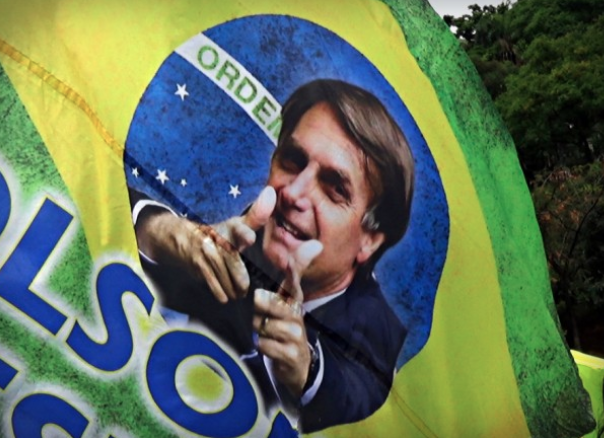 BUENOS AIRES — Brazil's president-elect, Jair Bolsonaro, has just joined what can be imagined as Latin America's core triangle of influence and power. Brazil is one of the region's three preeminent states, along with Mexico and Argentina. Its incoming leader, in this analogy, will represent the right-hand side of the triangle. On the left side is Andrés Manuel López Obrador, the Mexican president-elect. That leaves Argentine President Mauricio Macri as the remaining edge that connects the two — the center, as it were. Of the three, Macri is the only serving president. He's been in office for nearly three years and plans to seek reelection in 2019. Starting next year, the triangle will change completely. It's no secret that the West's political systems and traditional parties face huge challenges right now. The exception, at least so far, is the United States, where a two-party system has survived for almost two and a half centuries. But places like Spain and Italy — the two countries, incidentally, that have most contributed to creating the Latin American conscience, though from different historical perspectives — are facing threats of territorial separatism and new manifestations of fascism. The Latin American triangle has managed to renew itself through a drastic transformation of the system in which certain declining political groups will disappear while others will have to move, with all their weapons and baggage, into new spaces. And starting next year, the triangle will change completely, with the arrival of new actors and departure of others. In Argentina, for example, a coalition is governing for the first time and includes one member, PRO, that is entirely new to the national stage. In Mexico, the founding party of modern Mexico, the PRI, was practically crushed in the 2018 general elections, with its candidate coming third. The winner was MORENA (National Regeneration Movement), a new left-wing formation, led by López Obrador, that emerged from the ashes of the PRI's progressive aspirations. Then there's Bolsonaro's victory, which is of particular interest to Argentina. The "how" and "why" of this triumph is no longer so important. Nor is his archaic anti-communism, or his incendiary language, which he has toned down, in any case. What matters most, rather, is what he does. Evidently what he says or does (or will do) is his responsibility. He'll soon be the president of Brazil as a whole, so playing just to his base — the millions of indignant people who've had it with government corruption and ineptitude — won't suffice. As he comes to face the specific demands of governance, he should therefore mitigate his tendencies toward verbal extremism, as this could prove counterproductive. I must confess that if I were Brazilian, I could never have voted for Bolsonaro. Where he stands politically (and it's his prerogative to do so) is in stark contrast to social-democracy, that modest ideology embraced by so many citizens, myself included. Indeed, we have very different ideas about how the state should be organized, and about things like income distribution and respect for minorities of all kinds, be they racial, social or religious groups. What will the third leg of the triangle do? What role is there for Mauricio Macri? But it's also true that Argentina — in accordance with the norms of foreign affairs and for the sake of good neighborly relations — will and should treat the new president with the respect that the office (and the 50 million Brazilians who voted for him) deserve. His appointment of the anti-corruption judge Sergio Moro as the next justice minister should be noted here in his favor. In the meantime, Argentine and Brazilian economists have already begun quietely to meet. We are trading partners and should remain so. Still, the question remains: When Bolsonaro and López Obrador are sworn into office in the coming weeks, what will the third side of the triangle do? What role is there for Mauricio Macri? Undoubtedly, his is a most difficult task, especially given Argentina's current economic crisis. Macri will have to tackle the problem without ceding to pressures from various quarters or corporations, while meeting as far as possible the needs of the most vulnerable sectors. Then, he must relentlessly pursue the fight against corruption, working with the legal system as far as the law allows and implementing swift and effective prosecutions. Finally, he'll have to pay maximum attention to education at all its levels, regardless of the sacrifices to be made elsewhere. As the central portion of the triangle — the one that's neither right nor left, that deliberately occupies the space in between — Macri can send a message of moderation, and champion cohabitation as an alternative to the social and political rift that is becoming more dangerous by the day. Hopefully he can keep violence and intolerance at bay, and project this middle-ground approach into the future. Or maybe that's just wishful thinking.